Based on the outskirts of Detroit in little Clawson, Michigan, Oakland County FC, which was founded four years ago and now competes in the UPSL, created a Supporters Trust which gives a lifetime membership, and many other things. Here is their story. It's a simple soccer dream. A few friends, over a few pints, decide to start a club. By luck and hard work, by factors beyond conceiving, that club grows. It balloons into the stratosphere and rises through the ranks, surviving all the pitfalls, to climb to the top of the heap. Well, wake up. This is America. And that doesn't happen here. For the sport of soccer, at least, this is not the Land of Opportunity. The boys behind Michigan's Oakland County Football Club pose new questions: How do you grow the game from the grassroots in a country where the only way to the top is to have it bestowed upon you by your betters? How do you climb and grow and strive without hitting your head on all the ceilings above? "We all just shared a dream", said Theo Foutris, one-third of a trio of founders and co-owners who conceived of a soccer club that might connect with fans on the ground and grow something up organic and long-term. Fellow owner, former first team coach and current technical director Nicolino Morana added: "Our supporters’ trust was born out of that dream, to build something from the bottom up." Based on the outskirts of Detroit in little Clawson, Michigan, OCFC began life four years ago with only the humblest Sunday-morning intentions. By word of mouth, the club now draws some of the region's top talent and competes in the nationwide United Premier Soccer League (UPSL). And they find themselves at the tip of a spear, defending democratic ideals in the lower reaches of American soccer. Alongside the likes of Chattanooga FC, who made waves and landed in a recent issue of Forbes Magazine with their own supporters' trust, and NPSL sensations Detroit City, Oakland County FC are fighting the good fight for open doors and fan empowerment in American soccer. "We are proud to be part of the ever growing group of clubs that are using this mode" said Ben Rode, the club's third founder who's hoping to improve on the side's average attendance of 476 per game in the 2018 season when the team finished second-bottom of a six-team division. "And it's really simple, we want fan engagement. If you buy in, you’re a member for life and there’s something special about that." In addition to lifetime membership, you’re also encouraged to attend quarterly town hall style member forums. 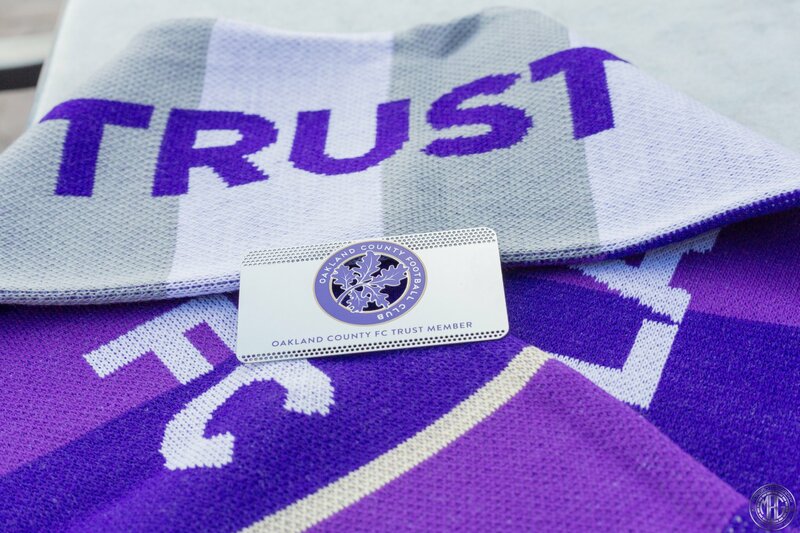 You get an official stock certificate, a season ticket (if you’re local – if you’re not, your ticket will be donated to a local), a member scarf and other perks. But most importantly, you have a stake, a say, and become a "part of something building from the grassroots," according to Morana. "A lot of people don’t get to reach out and touch what’s happening for the team they love," said Robert Kerr, a stay-at-home dad, freelance journalist and member of the supporters’ trust. A dual citizen who grew up in England with a love for both big-time Liverpool and little-time Peterborough, Kerr’s enthusiasm is palpable. And when a little team with a big dream appeared like magic in his hometown of Clawson (pop. Approx. 10,000) he says it was a "dream come true." He's one of 148 trust members at last count, a number that is expected to grow in the coming months and years. "I’ve never picked a Lions (Detroit’s NFL team) jersey – everything is so top-heavy here – so even if you’re helping make little decisions, you still feel like you have a say. It’s a starting point." "We have this group of people with a dedicated voice," added Morana. "They feel important and they are important. If the team loses, they’re still going to come out because they’re invested – they’re owners, stakeholders and members. This is not a three-year project for us, we’re looking ahead – we’re looking 50 years ahead." What Oakland County FC might become is a question for down the road. What they are is a club at the cutting edge, with a team kicking off in UPSL early this May with high hopes for success on the field to match their ambitions off it. "You feel like you’re a part of something big here," said Julian Birge, a Grand Rapids native and former midfielder at Alma College. He’s been with the club since the first open tryout in 2015. "More and more players are hearing about what we’re doing and we’re getting better every year because of it. This is a place where guys want to come play." Everyone at Oakland County seems to be dreaming the same dream. The players have their say on the field and the supporters have theirs in the stands and the trust. They may just be voting on shirt designs and other small stuff at the moment, but the thing about dreams -- they know no limits.